Princeton’s Carrington Akosa seems to be the favorite in both the 100m and 200m after placing fourth and third last year. His times of 10.67 and 21.25 are the tops in the league in wind-legal marks and can provide precious team points. Cornell’s Brailin Paulino placed second in both disciplines last year and is the likely main competitor to Akosa. He could lead his teammates of Alex Beck (10.69/21.45w) and Zach Menchaca (10.70/21.42) to multiple top placings this year. Penn’s rookie Calvary Rogers has exploded into the league after his narrow loss in the 200m Indoor Heps. He has run 10.73/21.55 (20.95w) so far outdoors, and can easily steal both of these races and break up a Cornell-Princeton stranglehold if healthy. Max Mondelli of Harvard has run well this year also (10.79/21.55) and should figure in the scoring of both races. Brown’s Ryan Kelly is the defending champ in the 200m and is definitely capable of repeating with a return to form, along with last year’s sixth place scorer Marc-Andre Alexandre of Yale. Alexandre is back to defend his 400m title after not competing at Indoors Heps. He has the fastest conference time of 46.99 this year. Ray Mennin of Princeton has improved this year after finishing fifth last year, with an indoor 400m championship and a 47.03 outdoor run. He should be considered a strong contender to dethrone Alexandre. Cornell’s Tobe Attah and Penn’s Jeff Wiseman finished second and fourth respectively last year and have a chance to possibly repeat these positions based on their performances to date. Kelly has run the #3 conference time (47.96), so a scoring berth is likely. Other scorers should include Michael Smith (Cornell), Larry Gibson (Cornell) and Joshua Freeman (Princeton). Expect a tight competitive race with placing being important for the title hopes of Cornell and Princeton. Cornell’s Max Hairston is the two-time defending champ in the 110m hurdles and is the only competitor under 14 seconds this year (13.95). This should be his race to lose. 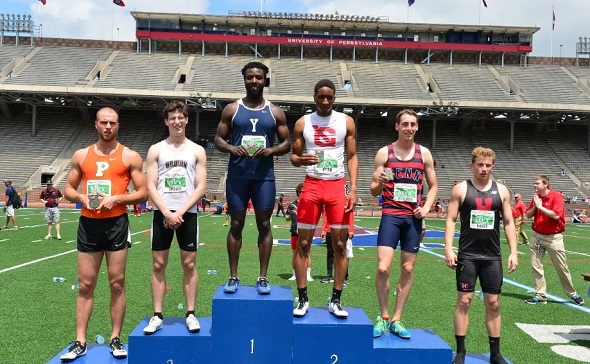 Last year’s runner up, Greg Caldwell of Princeton (14.36), should be in the mix for a similar position this year, along with Dartmouth’s Parker Johnson (14.20), and Yale’s Paedyn Gomes (14.17w). Jay Hebert (Harvard) was sixth last year and should also score this year. Wynndham Curtis of Cornell was third indoors and should figure into the scoring, along with veteran Ben Bowers of Penn. 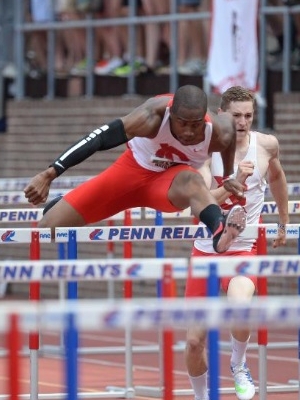 After finishing third last year, Hairston is the top returner in the 400m hurdles and lead the list this year (52.29). Curtis and Greg Leeper (Princeton) seems to be his biggest competition for the crown. The other two returners, Edward Wagner (Dartmouth) and Corey Hammond (Columbia) could figure into the scoring, while Spencer Long of Princeton and Johnson both have run well this outdoor season. This entry was posted on Friday, May 6th, 2016 at 11:00 am. It is filed under Heps Champs, Men, Spotlight, Team Previews. You can follow any responses to this entry through the RSS 2.0 feed.